This Slack bot gives users the ability to silently interact with Alexa using the same commands they would speak out loud. It allows users to communicate when the room is noisy, or when voice communication isn't appropriate. Not all commands are available, but it is a neat alternative to using the smartphone app. While S-Voice and Siri have lost users in the last year, Amazon Alexa has been growing rapidly over that time, according to a US analytics firm. Part of this success will have come from accompanying products such as the Amazon Echo and the smaller Echo Dot, which both allow users to interact with the service without needing to grab their smartphone. However, there are times when you want to communicate with Alexa, but it isn't a suitable time for voice commands. Situations such as when there is a noisy children's birthday party going on, or when you don't want to risk any background conversations being recorded. Sure, you can use the smartphone app for interaction, but it's mostly just like using any other app. What if you wanted to still interact with Alexa in the same style that you do when using voice commands? This is where Silent Echo comes in. 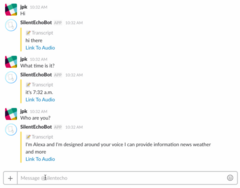 Developed by Bespoken, A spinoff of XappMedia, Silent Echo uses Slack to provide us with "SilentEchoBot" which TechCrunch says "...works by converting what you type in Slack into audio using text-to-speech, which is then sent to Alexa using Amazon’s own APIs. The audio reply Alexa returns is then converted back into text using speech-to-text". Due to this method, some types of commands that won't work over Slack. During our Echo Dot review, we commented on the data security risks associated with having a device listening for a trigger word, then recording everything it can hear in the room, before sending it all off to Amazon's servers for processing. Silent Echo also has data security risks that the user must consider. To provide this functionality, Silent Echo needs to be linked to your Alexa account, providing it with access to your information. Your interactions with the bot are recorded and stored on Bespoken's servers, too. If you're happy with engaging with these more advanced voice assistants, Silent Echo provides a natural way to interact with Alexa via text.